Basel Ghattas called on Israel Arabs to fight for 'their land' while Jamal Zahalka promised not to allow a 'second Nakba' in the Negev. Arab Knesset members took an active role Monday in events marking the 39th annual Palestinian holiday "Land Day." Land Day commemorates the initial government takeovers of land in the Negev and Galilee which were first announced in 1976. During ensuing riots and clashes with Israeli security forces, a number of Arabs were killed. Israeli Arabs and Palestinians call these takeovers land "expropriations," though Israel notes that these lands were taken over by authorities for security purposes, and were never actually legally owned by the Arab claimants. The main event of this year's Land Day was held in Deir Hanna in northern Israel. Members of the Joint Arab List were photographed there against the background of PLO flags. MK Basel Ghattas (Balad) called on Arab citizens of Israel to fight for their land by imposing facts on the ground and taking over the actual land. "Arabs citizens much take strong possession of the grounds as part of a legitimate strategy for land holding," Ghattas added. 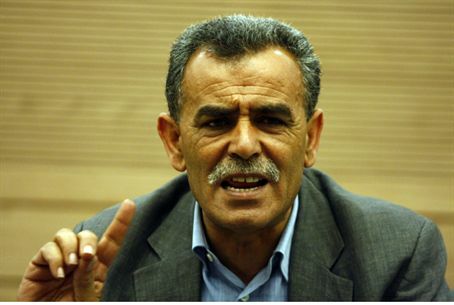 MK Jamal Zahalka (Balad), who participated in a Land Day rally in southern city Rahat promised constituents, "we will not allow a second Nakba in the Negev." "Today, hundreds protested. Here in Rahat, there were many demonstrations. If the government thinks it can compel us to giving up, through confiscation, hundreds of thousands of dumans, and the uprooting of tens of thousands of people from their houses, it is making a mistake," Zahalka charged. "I advise the government to change course...and instead come negotiate with the residents on the basis of recognizing their right to the land. [The government] is responsible for the deterioration of the situation." Earlier, Arab leaders warned that continuation of Israel's "discriminatory practices" against Arabs could spark violence at this year's commemorations. Indeed, deputy commander of the Gush Etzion Brigade, Lt. Col. Dotan Rovner, was injured Monday afternoon, after a Palestinian Arab threw a rock at him during a riot near Beitar Illit.